I received the following question from Warren Wilson, a reader of The Surprising God. I invite other readers to help me reply. 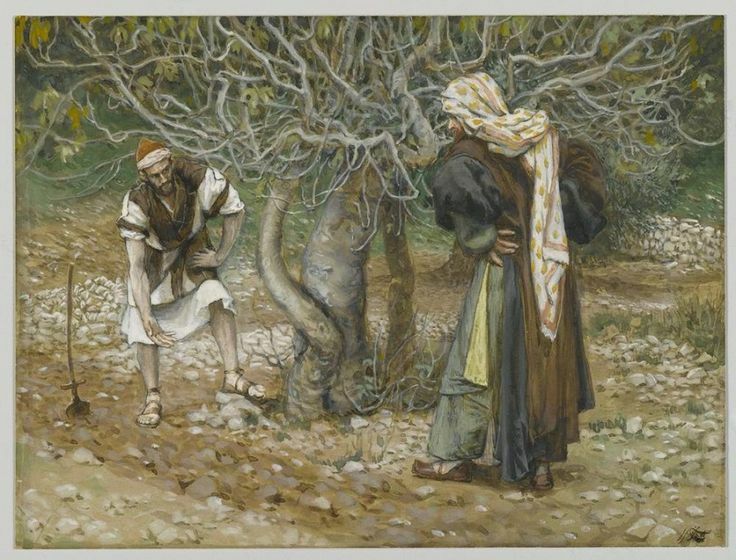 Luke 13:1-9 gives the parable of the barren fig tree. Obviously, we can understand our Lord's emphasis on repentance as encouragement for us to subjectively awaken to the salvation that is already ours through his life, death, resurrection and ascension. My question has to do with the apparent urgency with which he speaks. It has a now or never tone to it. "Better repent now because you don't know how much time you have." It gives the impression that they're excluded unless they repent. I've looked at what Robert Farrar Capon has to say about this parable and it is not satisfactory. While he does remind us that the vinedresser in the parable is the Jesus figure who came to save us, not to destroy us, and that Jesus will be our judge, not the Father. he makes it sound as if there's a possible conflict between God the Father, the owner of the vineyard who wants judgment now, and Jesus, the vinedresser who wants to give mercy and grace. He even goes so far as to say that Jesus is lovable, merciful and gracious, but he's not so sure about the Father or the Holy Spirit. So much for unity in the Trinity. Would you please discuss this parable from a Trinitarian perspective, especially the urgent tone he uses. The point of the parable for me is that everyone is going to die, just like the Galileans and those at the tower of Silaom. The cause of a person's death is not an indication of whether that person had a relaionship with the Triune God. He was warning people not to make judgments about others' lives but to make sure they changed their minds about who God is and that He has included everyone into his family. The open ending of the parable suggests that Jesus may have wanted his listerners to finish it for themselves. I think the vineyard owner is the Father, the gardener is Jesus, and the Holy Spirit is the fertilizer. The fig tree is humanity. The fig tree exists to bear fruit but it’s not fulfilling it’s purpose. Humanity exists to participate in the Triune Life as the children of the Father (Eph. 1:5) but we also are not living up to our purpose. If something isn’t achieving its purpose it might as well not exist, that’s why the vineyard owner says that he might as well destroy the tree. Not because he hates the tree but because he recognizes the pointlessness of having a tree that doesn’t bear fruit and his desire is to see it achieve it’s purpose. First, we think that the fig tree can make a conscious decision to change itself and begin to bear fruit. We forget that trees do not think and have no choice. They bear fruit based on the soil, rain, sun, and other conditions around them. So, Jesus says our failure to live up to our purpose is like something (a fig tree) which has no conscious control over its own destiny. Because we all fell in Adam it is no more possible for a human being to suddenly, on his own, say “oh! I’m not being who I’m suppose to be, I need to get busy” than it is for a tree to say “oh! I’m not bearing fruit, I better get busy.” The only way we’re going to achieve the purpose for which we were created is if the Good Gardener (Jesus) creates the conditions for us to naturally grow up to be what we were created to be. Secondly, we assume that the gardener is not a very good gardener. The gardener says to the vineyard owner “let me work on the tree and we’ll see if it bears fruit” and we – in our fallenness – automatically assume that it is going to be a dangerously close thing. We think, “oh no! what if the gardener fails? what if he can’t do it? the tree will be destroyed!” But how do we know that this gardener isn’t the very best gardener the world has ever seen? Maybe he’s so good there’s no danger at all of failure on his part. So, I would say this is the moral of the parable: the Father created us to live as his children, but we’re not doing a very good job of it. If we aren’t going to live as the children we were created to be then there’s no point in our existence. As human beings we even sense this ourselves as we struggle with depression, despair, and suicidal thoughts. Because of our fallenness we, like a fig tree, are incapable of fixing ourselves. So, the Father sends the Son – the greatest Master Gardener of all time – to heal us, make us whole, and enable us to grow up to be the children of the Father that we were created to be. It is his work, he is doing it, and what we need to do is repent of our false belief that he is not The Master Gardener and believe the truth that he knows how to make us healthy enough to fulfill our purpose. And how does the Gardener make us healthy? By nourishing our lives in his Holy Spirit – the fertilizer that brings the fruit of the Triune Life. Once we see the fig tree in this way we can see how this parable further explains Jesus’ comments about the people who died tragically at Pilate’s hands and in the natural disaster. The thing about all agriculture, including the tending of fig trees, is that it is very easy to look at a barren tree and assume that nothing is happening. The natural process of health and maturation takes time and patience – and it is not visible to us. We look at people around us, friends and family, and when we don’t immediately see the fruit of the Spirit in their lives we assume the Master Gardener is not at work in their lives and the Vineyard Owner is ready to destroy them. In fact, we can become so blind in our judgmentalism that when bad things happen to these “fruitless” people we assume that we are witnessing the Vineyard Owner’s destruction of them for their failure to be what they were created to be. But here’s the thing about the destruction of the fig tree: it never happens! The parable ends with the Master Gardener saying “don’t worry, I’ll take care of it.” So why are we all so worried? We don’t trust the Master Gardener will take care of it. And that is what it means, in the light of the gospel, to “perish.” To perish is to experience all the fear, anger, and grief that comes from not trusting that the Master Gardener will be successful. When we don’t trust that he will succeed we try to make ourselves fruitful, or try to harangue and cajole our friends and family into being fruitful, and that is the living death that comes from believing that we’re our own saviors instead of believing that Jesus is the Savior and that he has saved us. Thanks Helen and Jonathan for your insights. Let me add some historical/exegetical context. The back story here is that the Jews hated Pilate (Roman governor of Judea) because of his insensitivity to their religious convictions. The atrocity mentioned in v1 probably took place when Pilate “appropriated” money from the temple treasury to help finance an aqueduct. A crowd of angry Jews gathered in protest and Pilate had his soldiers murder a number of them, adding to the Jews’ hatred for their governor. Since Jesus was on his way to Jerusalem, anything he said about Pilate was sure to get there before him. If he ignored the issue, the crowd would accuse him of being pro-Roman. If he defended the Jews and accused Pilate, he would be in trouble with the Romans, and the Jewish leaders would have an excuse to get him arrested. Jesus’ reply to their question explains that human tragedies are not always divine punishments and that it is wrong to “play God” and pass judgment. Jesus thus exposes the logical conclusion of their argument: if God does punish sinners in this way, then they themselves had better repent because all people are sinners! The answer is that we live only because God is a God of grace. Jesus then illustrates this lavish grace of God with a parable about a barren fig tree (v6ff). The owner of a vineyard (as Jonathan rightly notes, representing God the Father) planted a fig tree in his vineyard (not an uncommon practice of that day). But after three years of caring for it he should have found figs, but did not, so he instructs the vineyard’s caretaker (and again, I agree with Jonathan that the caretaker represents Jesus) to cut down the barren tree. But Jesus' response is to call for more grace. And that’s where the story ends. Clearly this parable has both personal and national application. On the personal side, God, who has created all people by grace, remains gracious and long-suffering toward all people in their sin (2Peter 3:9)—forgiving them and encouraging them to turn to him and thus bear fruit. God has every right to “cut us down,” but in grace, through his Son, spares us. However, we must not presume upon God’s patience—eventually we must embrace or reject God’s grace in Jesus. We must repent of any idea that God is not gracious toward us all. On the national side (and this addresses Warren's question about "why the urgency? ", God waited several years during the ministries of both John the Baptist and Jesus, for the Jews to repent, but they would not — the Jewish nation produced no fruit. God then waited another forty years more before allowing the Romans to destroy Jerusalem with its temple. During those intervening years, the apostles gave the Jews a powerful witness of the Gospel of God's grace. Finally, the “tree” (the nation) was cut down, but God's plan to be gracious to all humanity through Jesus was not cut down - in fact it continues. As Jonathan notes, the parable is “open-ended,” requiring the listeners to supply their own conclusions. Did the tree bear fruit? Did the special care accomplish anything? Was the tree spared or was it cut down? We aren’t told — but we are invited to examine our own lives. Thus, the question is not “What happened to the tree?” but “What will happen to me?” The answer depends NOT on our own goodness or fruitfulness — but on whether or not we embrace the grace that God has given us in Jesus, thus sharing in Jesus' own fruitfulness. In the end, it’s all about Jesus and how he has included us all in God's grace, which includes his personal, human fruitfulness as our representative and substitute. Since there is no description of who is whom in the story, I don't think we can make assumptions as to the role of any of the characters. So I will disagree with Jonathan's starting point. But I also think that he argument holds some water even if we don't precisely name the characters. Far from showing a disunity in the Trinity, I think that there is lots of unity, though difference in course of action. Again, this is not disunity because even in the scriptures we see God listening to differing opinions on how to proceed. Jesus himself shows this in Gethsemane when he asked if the cup, that is the method of accomplishment of God's will, could be taken away. Much as what Jonathan says, there is unity in the purpose of bearing fruit. At the same time, there is agreement that if the "tree" doesn't want to bear fruit, the "owner" will give it what it wants in being disconnected without allowing it to take the place of a "tree" that will bear fruit. Another point to be noted is that there is no solution to the story. We don't know if or how long the tree was given. That is the infinite patience of the owner and vinedresser. God's purpose for us is to have us willingly react to what we are fed with and bear fruit. However he will not force us to grow and give us the separation we think we want. A closer look at Capon may be in order. His Trinitarian theology is much better than suggested here. But more (and I'm guessing you're looking at Capon's writing on the parables), the Christ figure in this parable does precisely what Christ does on the cross. The "let it be" used to plead for the vine is the same word as Christ's "Father, forgive them," spoken from the cross. What the vine dresser does here is precisely what Jesus does at the cross. And, at least at that level, I don't see any complication. Very helpful post and comments all the way around. The original post mentions possible problems with what Robert Capon has to say about the Trinity in exploring the meaning of the parable. However I agree Aelred’s comment that we should take a closer look at what Capon is saying. Part of Capon’s talent is his ability to creatively nudge (or even grab and shake) the reader to think beyond commonly cherished notions about God and salvation – especially when some notions are misconceptions developed partly at least due to familiarity. In Capon’s final paragraph about the parable (p. 251 of Kingdom, Grace, Judgment) he rightly concludes that we can’t save ourselves, and that Jesus came to save us. Then he refers not so much directly to the Father and Holy Spirit, but rather to misconceptions about the Father and Holy Spirit – alluding to misunderstandings about the “track record” of the Father, and alluding to confusing notions about the Holy Spirit that can sound like so much “hot air” – but shows that what works is trusting the grace of God that is revealed in Jesus. So I would say, in addition to the reminder that we only bear fruit in Christ, Capon offers the reminder that Jesus truly knows the Father and the Holy Spirit, and that because we are in Jesus, we know and are known (and accepted) as well. Without Jesus, we wouldn’t know the Triune God. It’s about the Word made flesh, and if our trust and our thinking aren’t centered in that living Reality, we can easily fool ourselves. Thanks again Ted and all. Thanks for the helpful comments on this post. I imagine you all helped the person originally asking the question - he was considering preaching on this parable. Maybe he'll give us some feedback. By the way, I personally have found the work of Robert Capon to be very helpful in understanding the parables of Jesus. I recommend, in particular, Capon's book, "Kingdom, Grace, Judgment" (Eerdmans, 2002). It goes though most of Jesus' parables and does a marvelous job of viewing them in the light of the gospel, and the progression of Jesus' ministry leading to the cross and beyond. The parables have much to teach us about the shocking and unexpected nature of the gospel of pure grace in the person of Jesus. I'm the one who originally asked the question. I'm part of a Wednesday morning Lectionary study group with seven other pastors. It was my turn to teach when Luke 13:1-9 was the Gospel reading. Unfortunately, several of the evangelical pastors who are a part of the group strongly believe in the theology of separation. Their take on the urgency expressed in this passage reinforces their belief that we must repent in this life or else there's no hope - off to hell you go. I appreciate all of your comments. I always look at Robert Farrar Capon's book on parables when considering one. I confess I haven't read enough of his writings to alway understand where he's coming from. I'm sure he says certain things for shock value in order to get us to think. His comments about not being sure about the Father or Holy Spirit probably does point out that it was the Son who become incarnate and lived among us. We can be sure about Jesus and because God is a Trinity, indirectly we can be sure about the Father and the Holy Spirit as well. I liked the comment about remember that it's Jesus who's doing the fertilizing. It reminds me that Jesus is at work in everyone's life. I may not see the evidence of that, but it's true. God has delegated all judgment to the one who lived as a human being and died for us. Is there any reason to worry? I don't think so. Thanks for sharing your good content.